This week’s 16th annual Society of Plastics Engineers TPO Automotive Engineered Polyolefins Conference was bigger and better than ever. More than 500 people attended the conference, most of them representing molders, tier suppliers and OEMs in the automotive industry. The event, held annually in Detroit, has grown steadily over the last few years and seems to be outgrowing the current venue. In addition, attendees included 15 media members from the automotive and plastics press. The media attendees even included Chinese and Spanish language publications this year. The exhibitors were also at an all-time high, with 72 exhibiting companies, including Americhem, occupying much more floor space than in prior years. There were over 60 technical presentations given and several of the topics revolved around an environmental theme. IAC and Ford gave one of the initial papers on bio-based materials, and that conference hall was dedicated to environmental topics for the balance of the conference’s first day. Another key theme was lightweighting of polyolefin parts, and this topic continues to be a big focus in this industry as OEMs struggle to meet Corporate Average Fuel Economy (CAFE) standards. These topics were of specific interest to Americhem, as this week, our automotive manufacturing plant in Ohio is completing an ISO 14001 audit. This standard sets out the criteria for an Environmental Management System. More and more automotive suppliers are realizing the importance of this standard to their customers. With the record attendance, the exhibitor hall was filled with Tier suppliers and OEM’s looking for suppliers who can help them solve complex problems and add value in the global automotive marketplace. For our part, Americhem’s booth was visited by most of our automotive customers. Our message revolved around Americhem’s color management capabilities. 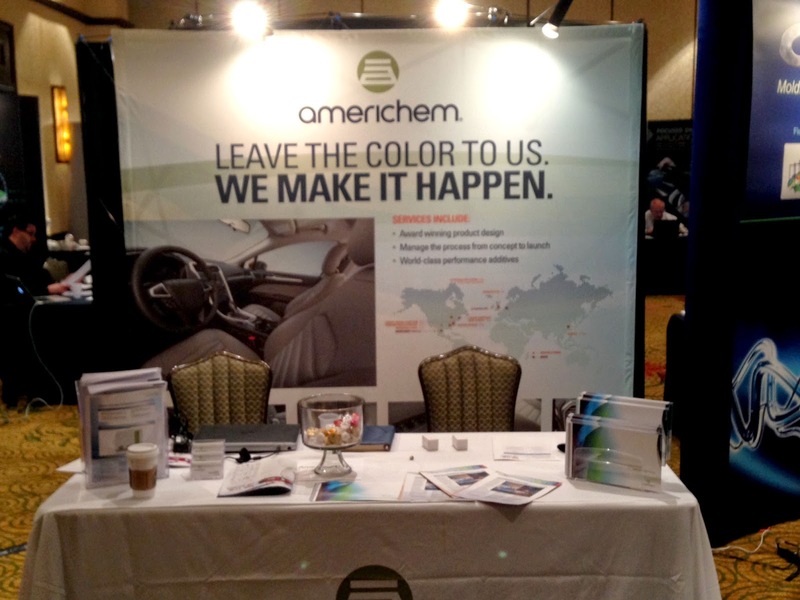 As a global supplier of automotive color masterbatch, Americhem helps OEM’s and Tier 1’s manage the variability of raw materials used in extrusion and injection molding technologies. With examples we can point to from our work with a large global OEM, we are able to demonstrate the color harmony that Americhem helps promote across different materials, plants, suppliers and geographies. The message is becoming more commonly understood and is gaining momentum within the industry. It’s exciting to be part of the growing community that this conference represents. We certainly plan to keep our ear to the pulse of these SPE members and the tier suppliers and OEM customers they represent. We look forward to participating again in 2015.